Shenzhen, China, 30 Sep, 2011: Huawei, a leading global information and communications technology (ICT) solutions provider, and the Subscriber Profile User Group (SPUG), a leading subscriber data management (SDM) industry group, jointly hosted the second annual SDM & Policy Control Seminar 2011 on September 14-15 in Xi’an, China. The theme of this year’s seminar was “Utilize SDM and Policy Control to Generate Revenue,” and over 120 delegates from more than 30 leading global telecom operators attended and shared their perspectives, strategies, and best practices. SPUG presented its own insights on how best to provide personalized services using the emerging industry trends of multi-sided business models, social networking, machine-to-machine, cloud services, and targeted marketing. Industry research partner Heavy Reading as well as Works Systems, a key device management vendor, also provided their insights on these industry trends. Eleven industry players, including Telefónica, China Mobile, Telkomsel, TrueMove, SPUG, and Works Systems, made keynote presentations covering current hot industry topics. In addition, Huawei introduced its vision and shared its ideas on subscriber intelligence, a key prerequisite for SDM development. Huawei also presented its state of the art service demos to the audience. These various demos illustrated how Huawei’s SDM solution, SingleSDB, is able to open subscriber data to third parties in order to better push the target service. 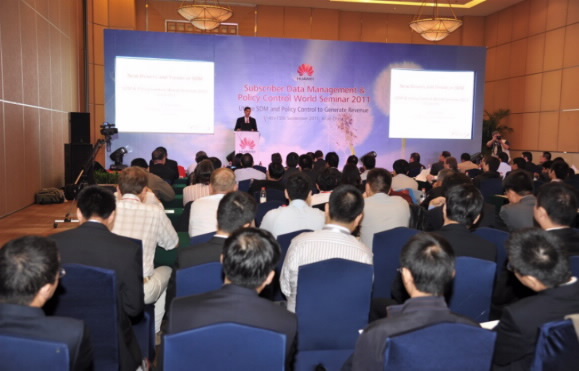 In order to better demonstrate the capabilities of its SDM solution, Huawei invited the audience to visit its SingleSDB reference site, which was established by Shaanxi Mobile in 2010. Other new SDM demos included Wi-Fi offload, unified identification, and LTE smooth evolution. Additionally, with regard to the policy and charging rules function (PCRF), Huawei also showcased its GUP, VIP, walled-garden service, push, and other value-added services.